1. Marriage Preparation: Contact your local parish to arrange for your marriage preparation. This ordinarily includes meetings with a priest or deacon, completion of required paperwork, the use of a premarital inventory (such as FOCCUS or PMI) which will be discussed with the priest or deacon, and participation in an Engaged Encounter Weekend or other similar program offered in your own diocese. Cautionary note on fraudulent clergy: Beware of individuals who pass themselves as legitimate Catholic priests but who, in fact, are not. Sometimes referrals to such individuals are made by secular wedding coordinators. Make sure that the priest you are dealing with is in full communion with the pope and the bishop of Honolulu. Weddings celebrated by fraudulent clergy are invalid. The Office of Canonical Affairs of the Diocese of Honolulu will then review and approve the authentic documents and forward them to the priest or deacon here in Hawaii who will be celebrating your wedding. Note: If the paperwork is incomplete or includes photocopied documents, it will all be mailed back to the sending diocese. Photocopies of all authentic documents mailed should be kept by the parish sending the documents out until it is certain that they have arrived at the parish where the wedding will take place. 5. Liturgy Planning: Plans regarding music, choice of readings, and other details of the ceremony need to be arranged with the parish where the marriage will take place. Marriages where only one party is Catholic are celebrated with a full ceremony but ordinarily outside Mass. 6. Church of Wedding: Marriages are to take place inside a Catholic church or oratory. This requirement reflects the fact that marriage is a religious vocation and a public celebration of the Church community. Exceptions in the case of a marriage between a Catholic and a baptized non-Catholic: Permission to celebrate the marriage in a non-Catholic church building may be sought if there are objections of conscience by non-Catholics to entering a Catholic church building. In such a case, the Catholic party must write a letter to the director of canonical affairs (6301 Pali Hwy., Kāneohe, HI 96744) of the Diocese of Honolulu stating the reasons for this request. The priest or deacon celebrating the wedding must also agree to this, and the couple needs to make arrangements with the non-Catholic Christian minister to use his building. Exceptions in the case of a marriage between a Catholic and a non-baptized person: If objections of conscience arise by non-Catholics to entering a Catholic church building, permission may be sought to celebrate the marriage in a non-Catholic religious building or in another suitable place. If possible, the ceremony should be celebrated in a chapel-like arrangement or in a room apart from the place where the meal or reception will take place. In such a case, the Catholic party must write a letter to the director of canonical affairs of the Diocese of Honolulu (6301 Pali Hwy., Kāneohe, HI 96744) stating the reasons for this request, the name and address of the proposed place, and a complete description of the indoor setting that is proposed for the marriage. The priest or deacon celebrating the wedding must also agree to this. 7. Marriage License for the Couple: In Hawaii, no blood tests, waiting period, or residence or citizenship is required to obtain a marriage license. Licenses are issued by the Department of Health, expire in 30 days, and are good anywhere in the state of Hawaii. For the steps required to apply for a marriage license, go to eHawaii.gov. Validations: For couples already civilly marriage now validating in the Catholic Church, the procedure is the same as a first time wedding. The only differences are that a copy of the existing civil marriage certificate must be provided along with the rest of the prenuptial paperwork listed above and it is not necessary to get a license from the Department of Health. 8. The marriage license must be presented to the priest or deacon at least 24 hours before the rehearsal. The priest or deacon who officiates at the marriage is responsible for registering the marriage online. 9. Arrival in Hawaii: Plan on arriving a few days before your scheduled wedding to meet with the priest or deacon who will be officiating at your wedding. The marriage license may be given to the priest or deacon at this time. 1. 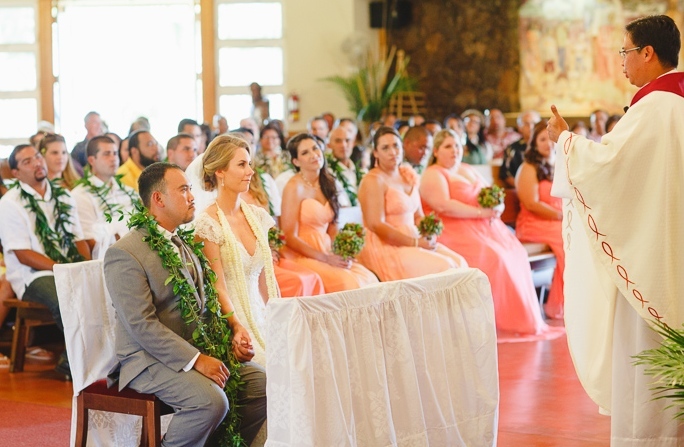 Canonical Requirements: The visiting priest or deacon should contact the pastor in Hawaii where the wedding will take place to make initial arrangements to officiate at the wedding. Be on letterhead of the diocese or religious institute of the visiting priest or deacon (no photocopies or faxes are acceptable). Include the visiting priest or deacon's full name and address. State that the priest or deacon is in good standing. Contain information regarding the specific wedding that he will be celebrating, including the names of the couple, the date of the wedding, and the name and place of the church. 3. The visiting priest or deacon should ask the pastor for delegation to assist at the marriage. (He can also get this delegation from a parochial vicar or deacon assigned to the parish.) The delegation should be noted in the marriage paperwork. The marriage is to be recorded in the church where the wedding takes place, and the paperwork is to be filed there. weddings on the Hawaii Department of Health website. Important: It is the responsibility of the visiting priest or deacon to secure the temporary license to perform weddings! 5. The officiating priest or deacon is to receive the couple's civil marriage license at least 24 hours before the rehearsal. He must then report the marriage within three days according to the exact procedures established by the Hawaii Department of Health.